Starwood SPG is promoting their 2014 Music Tour with a chance to win an all-expense trip to one of their concerts and also $50 Ticketmaster cash codes. Win an all-expense paid trip to your choice of 1 of the 9 global music events. To enter tweet a photo of your favorite scene at or around a Starwood hotel or resort, tag it with #spgtheworld and include the hotel or resort name. Tweet up to 10 scenic photos per day through May 1, 2014. Starwood ran a similar Music Tour in 2012. You can buy tickets to the concerts with your SPG points at moments by SPG Auctions or you can win them in the contest. Earn a $50 Ticketmaster® Cash Code with every eligible two (2) nights booked via the SPG® Apps for iPhone®, iPad® and Android™, and consumed between April 3, 2014, and May 31, 2014 (the “promotion period”), at more than 1,100 participating Starwood properties. NOTE: You MUST book using a mobile APP! According to the terms and conditions, third party (including but not limited to travelocity.com, expedia.com and orbitz.com) or via spg.com are NOT considered eligible for this promotion. 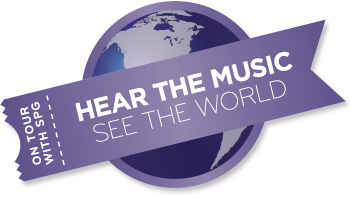 You could win an all-expense paid trip to your choice of 1 of 9 global music events. You must be an SPG member to participate. If you are not, sign up for a free account here. Tweet a photo of your favorite scene at or around a Starwood hotel or resort (it should be in the same city), tag it with #spgtheworld and include the hotel or resort name. Tweet up to 10 scenic photos per day through May 1, 2014. If you don't have a twitter account, you can sign up for one here. Note: Only one (1) unique Starwood Hotels & Resorts property per entry. This is my shortened version, but read all the specifics starting with #7 in the terms and conditions — its a long list. Most are obvious. don't post anything with clothing with visible brands, logos, trademarks, etc (since you aren't allowed to have people in the photo, I guess this means your own clothes, so don't take a photo of your own Ed Hardy clothes on the bed in the room). First Prize: One (1) winner will receive 25,000 Starpoints. Approximate Retail Value $875. Second Prize: One (1) winner will receive a fifty-dollar ($50) Ticketmaster Cash Code Gift Card. I would choose purely based on location — either Dubai, Argentina, or China. Which would you choose if you won? Here's the post from flyertalk as a reference.